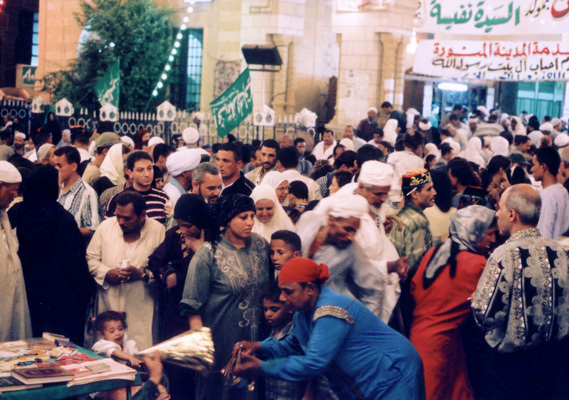 The appearance of mawlids is chaotic at the first sight: pilgrims' tents, ecstatic rituals, commerce, amusements, very loud religious music, and heavy crowds. It is not a coincidence that in the Egyptian idiom 'a mawlid in the absence of its master' - i.e. the saint - (mulid wi-sahbuh ghayib) implies a state of total disorder. But mawlids do have their order, only it is of a flexible, ambiguous, festive kind that allows for very different celebrations to come together in the "great night", the final and biggest night of festivity. In the words of a pilgrim "The mawlid collects the pious and the sinner alike. So you see very many things in the mawlid. There is safety in it, and that collects the bad, because where else should they go. So they come and do the things they want to. The mawlid is like a bus: in it travel the sheikh and the thief, all of society. You see the swing-boats and the sheikh, it's all in there." So where does the bus go, I asked. his answer: "To our lord the Prophet, God willing."